MILWAUKEE— The Bureau of Alcohol, Tobacco, Firearms and Explosives (ATF) is looking for the public’s help in locating persons of interest who could advance the arson investigation into several Sherman Park businesses that were set ablaze during the August 2016 riots. 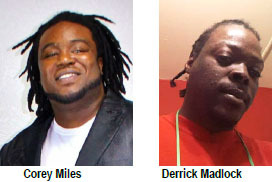 ATF is looking for Corey Miles and Derrick Madlock who are believed to be in the Milwaukee area. Anyone with information on these individuals’ whereabouts is asked to contact ATF. Call 1-888-ATF-FIRE (283-3473), email ATFTips@atf.gov or submit information anonymously through the “ReportIt” website or mobile app. ATF strongly believes in protecting the identity of those reporting information. When using ReportIt, select “ATF - St Paul Field Division” as the reporting agency. Provide as much information as you can relating to the whereabouts of these individuals.